On 30 June 2016, Lieutenant General Charles D. Luckey became the 33rd Chief of Army Reserve, and Commanding General, United States Army Reserve Command (USARC). On 2 November 2012, Command Sergeant Major James Lambert was sworn in as the Interim Command Sergeant Major of the Army Reserve, serving as the Chief of the Army Reserve's senior advisor on all enlisted soldier matters, particularly areas affecting training, leader development, mobilization, employer support, family readiness and support, and quality of life. On 23 April 1908 Congress created the Medical Reserve Corps, the official predecessor of the Army Reserve. 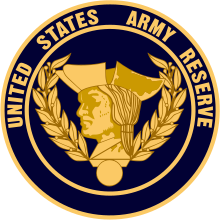 After World War I, under the National Defense Act of 1920, Congress reorganized the U.S. land forces by authorizing a Regular Army, a National Guard, and an Organized Reserve (Officers Reserve Corps and Enlisted Reserve Corps) of unrestricted size, which later became the Army Reserve. This organization provided a peacetime pool of trained Reserve officers and enlisted men for use in war. The Organized Reserve included the Officers Reserve Corps, Enlisted Reserve Corps, and Reserve Officers' Training Corps (ROTC). The Organized Reserve infantry divisions raised immediately after World War I continued the lineage and geographic area distribution of National Army divisions that had served in the war. They were maintained on paper with all of their officers and one-third of their enlisted men. Units in other arms of the Army besides infantry, most notably cavalry, field artillery and engineers were also formed. Organized Reserve units, depending upon their geographic area, maintained relationships with one or several colleges or universities, which populated them with officers through the ROTC. In the event of war, Organized Reserve officers and enlisted men would be called to duty to form the cores of the divisions they were assigned to, and also be moved to other parts of the Army that needed officers. Service in the Organized Reserve during the interwar period was not as appealing as the Army expected. Most divisions reached their full complement of officers, but had less than 100 enlisted men, since there was no incentive for them to serve. The 101st Infantry Division was designated a division of the Organized Reserve after World War I and assigned to the state of Wisconsin; unlike the 82nd Airborne Division, the Reserve division was disbanded when the 101st Airborne Division was raised in the Army of the United States on 15 August 1942. A tentative troop basis for the Organized Reserve Corps (ORC), prepared in March 1946, outlined 25 divisions: three armored, five airborne, and 17 infantry. These divisions and all other Organized Reserve Corps units were to be maintained in one of three strength categories, labeled Class A, Class B, and Class C. Class A units were divided into two groups, one for combat and one for service, and units were to be at required table of organization strength; Class B units were to have their full complement of officers and enlisted cadre strength; and Class C were to have officers only. The troop basis listed nine divisions as Class A, nine as Class B, and seven as Class C.
Major General Ray E. Porter therefore proposed reclassification of all Class A divisions as Class B units. Eventually the War Department agreed and made the appropriate changes. Although the dispute over Class A units lasted several months, the War Department proceeded with the reorganization of the Organized Reserve Corps divisions during the summer of 1946. That all divisions were to begin as Class C (officers only) units, progressing to the other categories as men and equipment became available, undoubtedly influenced the decision. Also, the War Department wanted to take advantage of the pool of trained reserve officers and enlisted men from World War II. By that time Army Ground Forces had been reorganized as an army group headquarters that commanded six geographic armies. The armies replaced the nine corps areas of the prewar era, and the army commanders were tasked to organize and train both Regular Army and Organized Reserve Corps units. The plan the army commanders received called for twenty-five Organized Reserve Corps divisions, but the divisions activated between September 1946 and November 1947 differed somewhat from the original plans. The First United States Army declined to support an airborne division, and the 98th Infantry Division replaced the 98th Airborne Division. After the change, the Organized Reserve Corps had four airborne, three armored, and eighteen infantry divisions. The Second Army insisted upon the number 80 for its airborne unit because the division was to be raised in the prewar 80th Division's area, not that of the 99th. Finally, the 103rd Infantry Division, organized in 1921 in New Mexico, Colorado, and Arizona, was moved to Iowa, Minnesota, South Dakota, and North Dakota in the Fifth United States Army area. The Seventh Army (later replaced by Third Army), allotted the 15th Airborne Division, refused the designation, and the adjutant general replaced it by constituting the 108th Airborne Division, which fell within that component's list of infantry and airborne divisional numbers. Thus the final tally of divisions formed after World War II appears to have been the 19th, 21st, and 22d Armored Divisions; the 80th, 84th, 100th and 108th Airborne Divisions; and the 76th, 77th, 79th, 81st, 83rd, 85th, 87th, 89th, 90th, 91st, 94th, 95th, 96th, 97th, 98th, 102nd, 103rd, and 104th Infantry Divisions. A major problem in forming divisions and other units in the Organized Reserve Corps was adequate housing. While many National Guard units owned their own armories, some dating back to the nineteenth century, the Organized Reserve Corps had no facilities for storing equipment and for training. Although the War Department requested funds for needed facilities, Congress moved slowly in response. The Organized Reserves were redesignated 25 March 1948 as the Organized Reserve Corps. Recognizing the importance of the Organized Reserve to the World War II effort, Congress authorized retirement and drill pay for the first time in 1948. During the summer and fall of 1951 the six army commanders in the United States, staff agencies, and the Section V Committee (created after World War I for the reserve components to have a voice in their affairs), evaluated Department of the Army reorganization plans for the ORC. The army commanders urged that all divisions in the Organized Reserve Corps be infantry divisions because they believed that the reserves could not adequately support armored and airborne training. They thought thirteen, rather than twelve, reserve divisions should be maintained to provide a better geographic distribution of the units. The Section V Committee opposed the reduction of the Organized Reserve Corps from twenty-five to thirteen divisions because it feared unfavorable publicity, particularly with the nation at war. On 20 December the Vice Chief of Staff of the United States Army, General John E. Hull, directed the reorganization and redesignation of airborne and armored divisions as infantry as soon as practicable. In March 1952 the 80th, 84th, 100th, and 108th Airborne Divisions were reorganized and redesignated as infantry divisions, and the 63d, 70th, and 75th Infantry Divisions replaced the 13th, 21st, and 22d Armored Divisions. Before the dust had settled on the reforms, the Army realized that it had failed to improve unit manning or meet reasonable mobilization requirements. In the fall of 1952 Army leaders thus proposed that the personnel from the thirteen inactivated Army Reserve divisions be assigned to strengthen the remaining twelve divisions. To keep the unneeded fifteen Army Reserve divisions active, they were to be reorganized as training divisions to staff training centers upon mobilization or man maneuver area commands for training troops. The continental army commanders implemented the new Army Reserve troop basis in 1955 piecemeal. They reorganized, without approved tables of organization, the 70th, 76th, 78th, 80th, 84th, 85th, 89th, 91st, 95th, 98th, 100th, and 108th Infantry Divisions as cadre for replacement training centers and organized the 75th "Maneuver Area Command" using the resources of the 75th Infantry Division. Two years later the 75th Infantry Division was inactivated along with 87th Infantry Division. Assets of the 87th were used to organize a maneuver area command; thus one unneeded division remained in the troop basis. While the Korean War was still underway, Congress began making significant changes in the structure and role of the Army Reserve. These changes transformed the Organized Reserve into the United States Army Reserve, from 9 July 1952. This new organization was divided into a Ready Reserve, Standby Reserve, and Retired Reserve. Army Reserve units were authorized twenty-four inactive duty training days a year and up to seventeen days of active duty (called annual training). In 1959 the Army decided to realign National Guard and Army Reserve divisions under Pentomic structures. Secretary of Defense Neil H. McElroy decided on 10 Army Reserve divisions. By October 1959 ten Army Reserve infantry divisions completed their transition, but at a reduced strength. The eleventh combat division in the Army Reserve, the 104th, was converted to training, for a total of thirteen training divisions, all of which were in the Army Reserve. To reorganize the Army Reserve to the new ROAD structures in the early 1960s, the Army Staff decided to retain one Army Reserve division in each of the six Army areas and to eliminate four divisions. Army commanders selected the 63d, 77th, 81st, 83d, 90th, and 102d Infantry Divisions for retention and reorganized them under ROAD by the end of April 1963. Each division had two tank and six infantry battalions. With the elimination of the 79th, 94th, 96th, and 103d Infantry Divisions, the Army decided to retain their headquarters as a way to preserve spaces for general and field grade officers. It reorganized the units as operational headquarters (subsequently called command headquarters [division]) and directed them to supervise the training of combat and support units located in the former divisional areas and to provide for their administrative support. Some former divisional units assigned to the four divisions were used to organize four brigades, which added flexibility to the force as well as provided four general officer reserve billets. In January and February 1963 the 157th, 187th, 191st, and 205th Infantry Brigades were organized with headquarters in Pennsylvania, Massachusetts, Montana, and Minnesota, respectively. The designation of each brigade was derived from the lowest numbered infantry brigade associated with the division under the square structure. As with the Regular Army brigades, the number and type of maneuver elements in each Army Reserve brigade varied. In November 1965, a long-standing controversial goal of the Defense Department, a reduction of the reserve troop basis, was achieved. Those reserve units that were judged unnecessary and others that were undermanned and underequipped were deleted and their assets used to field contingency forces. Among the units inactivated were the last six combat divisions in the Army Reserve, the 63d, 77th, 81st, 83d, 90th, and 102d Infantry Divisions, and the 79th, 94th, and 96th Command Headquarters (Division). The 103d Command Headquarters (Division) was converted to a support brigade headquarters. A number of U.S. Army Reserve corps headquarters were disestablished on 31 March 1968. They were reorganized as Army Reserve Commands. U.S. Army Reserve Sgt. Maj., left, instructs U.S. Navy Midshipman on proper body positioning during live-fire marksmanship training in June 2005. Reserve soldiers perform only part-time duties as opposed to full-time (active duty) soldiers, but rotate through mobilizations to full-time duty. When not on active duty, reserve soldiers typically perform training/service one weekend per month, currently referred to as Battle Assembly, and for two continuous weeks at some time during the year referred to as Annual Training (AT). Many reserve soldiers are organized into Army Reserve troop program units (TPU), while others serve in active Army units as Individual Mobilization Augmentees (IMA), or are in non-drilling control groups of the Individual Ready Reserve (IRR). Reserve Soldiers may also serve on active duty in support of the US Army Reserve (USAR) in an Active Guard/Reserve (AGR) status. All United States Army soldiers sign an initial eight-year service contract upon entry into the military. Occasionally, the contract specifies that some of the service will be in the Regular Army (also called Active Component/AC) for two, three, or four years; with the remaining obligation served in the Reserve Component (RC). Though typically, Soldiers sign contracts specifying that all eight years be served in the RC, with the first 6 years in drilling status and the last 2 years in non-drilling IRR status. Soldiers entering directly into the U.S. Army Reserve nevertheless encompasses a period of initial active duty training (IADT). The amount of time begins with approximately 9 weeks of Basic Combat Training (BCT), but total IADT time varies according to the enlistee's elected Military Occupational Specialty (MOS) which dictates Advanced Individual Training (AIT). All U.S. Army Reserve soldiers are subject to mobilization throughout the term of their enlistment. Soldiers who, after completing the AC portion of their enlistment contract choose not to re-enlist on active duty, are automatically transferred to the RC to complete the remainder of their Statutory Obligation (eight-year service total) and may be served in a drilling Troop Program Unit (TPU), Individual mobilization Augmentee (IMA), or Individual Ready Reserve (IRR) status. The Army Reserve was composed of 199,500 soldiers as of mid-2018. Reserve psychological operations soldiers hand out school supplies for Iraqi children. In 1980, the peacetime USAR chain of command was overlaid with a wartime trace. In an expansion of the roundout and affiliation programs begun ten years earlier, CAPSTONE purported to align every Army Reserve unit with the active and reserve component units with which they were anticipated to deploy. Units maintained lines of communication with the units – often hundreds or thousands of miles away in peacetime – who would presumably serve above or below them in the event of mobilization. This communication, in some cases, extended to coordinated annual training opportunities. Despite the commonly held belief that CAPSTONE traces were set in stone, the process of selecting units to mobilize and deploy in 1990 and 1991 in support of Operation Desert Shield and Desert Storm largely ignored CAPSTONE. In the post-Cold War draw-down, all of the Army Reserve's combat units were disbanded, except the 100th Battalion, 442nd Infantry Regiment. This meant the disestablishment of the three remaining Army Reserve fighting brigades: the 157th Infantry Brigade (Mechanized) (Separate) of Pennsylvania, the 187th Infantry Brigade (Separate) of Massachusetts, and the 205th Infantry Brigade (Separate) (Light) of Minnesota. Many of the Army Reserve training divisions were realigned as institutional training divisions. With the Army National Guard providing reserve component combat formations and related combat support units, the Army Reserve is configured to provide combat support, combat service support, peacekeeping, nation-building and civil support capability. With roughly twenty percent of the Army's organized units and 5.3 percent of the Army's budget, the Army Reserve provides about half of the Army's combat support and a quarter of the Army's mobilization base expansion capability. Special warfare combatant-craft crewmen attach a naval special warfare 11-meter rigid-hull inflatable boat to an Army Reserve CH-47 Chinook helicopter. 100% of chemical brigades, internment brigades, judge advocate units, medical groups, railway units, training & exercise divisions, and water supply battalions. more than 67% of civil affairs units, psychological operations units, transportation groups, motor battalions, chemical battalions, hospitals, medical brigades, and theater signal commands. nearly 50% of petroleum battalions, Adjutant General units, petroleum groups, transportation commands, terminal battalions, and public affairs units. In fiscal years 2007–2009, the Army Reserve was realigned into a functional command structure. The majority of Army Reserve units are now assigned to operational and functional commands. Operational commands are deployable elements which command deployable units of the same or similar capabilities regardless of peacetime geographic location. For instance, the 377th Sustainment Command (Theater) commands all Army Reserve sustainment units, while the 11th Aviation Command commands all Army Reserve aviation assets. Likewise, functional commands are responsible for command of units of the same or similar capabilities regardless of peacetime geographic location, but are not, as a headquarters, deployable. The training structure has been transformed in order to streamline command and control. Instead of multiple training divisions, each with its own geographic area of responsibility, the new structure features four training commands responsible for specific categories of training throughout the United States. Each command is configured for either initial entry training, advanced individual training schools, leader development or battle command training. These commands train soldiers of the Army Reserve, Army National Guard and the active component, through formal classroom and “hands on” training. Two training support commands under the First United States Army, designated First Army East and First Army West, provide customized, realistic unit-specific and operation-specific training. Training Support Commands (TSC) plan, conduct and evaluate training exercises for Army, Army Reserve and Army National Guard units. TSC are organized under the United States First Army into two subordinate units. As a part of this realignment, most of the regional readiness commands were eliminated, leaving only seven globally. These were redesignated "[regional, civil or mission] support commands"; the four in the Continental United States being "regional"; the geography for which each regional support command increased significantly, but all of the support commands were stripped of their former command and control authority over units in their respective territories. Instead, the support commands provide base operations and administrative support to Army Reserve units within their geographic region. OCAR provides the Chief of Army Reserve (CAR) with a staff of functional advisors who develop and execute Army Reserve plans, policies and programs, plus administer Army Reserve personnel, operations and funding. The CAR is responsible for plans, policies and programs affecting all Army Reserve Soldiers, including those who report directly to the Army. OCAR is composed of specialized groups that advise and support the CAR on a wide variety of issues. Through USARC, the CAR commands all Army Reserve units. USARC is responsible for the staffing, training, management and deployment of its units to ensure their readiness for Army missions. The Army Reserve consists of three main categories of units: operational and functional, support, and training. Due to Base Realignment and Closure Act, the headquarters of USAR has moved to Ft. Bragg. The Individual Ready Reserve (IRR) consists of individuals who are active reservists but not assigned to a particular Active Reserve Unit. Members of the IRR are encouraged to take advantage of training opportunities and are eligible for promotion provided all requirements are met. The Retired Reserve consists of soldiers who have retired from either the active or reserve components of the Army but have not reached the age of 60. The Army of the United States (AUS) is the official name for the conscripted force of the Army that may be raised at the discretion of the United States Congress, often at time of war or mobilization for war. The Army of the United States was first established in 1940 and its last use of the AUS was in 1974. The predecessors of the AUS were the National Army during World War I and the Volunteer Army during the American Civil War and Spanish–American War. ^ "Lieutenant General Charles D. Luckey". United States Army Reserve. Retrieved 10 July 2016. ^ "Command Sergeant Major James Lambert". Army Reserve. Retrieved 15 November 2012. ^ The Army Reserve at 100: An Emerging Operational Force. Army Logistician, volume 40, issue 6. ^ Army Reserve: A Concise History, 2012, p.4. Exact date for OR-ORC from Army Lineage and Honors. ^ "Chapter IX: The Korean War and its Aftermath". Archived from the original on 4 April 2008. ^ Army Reserve: A Concise History, 2012, p.8-9. Exact date from Army Lineage and Honors. ^ Wilson, "Reorganization of Army Reserve". Army Reserve Magazine. Army Reservist (12 (Jul-Aug 66): 4-5): 7. Archived from the original on 17 January 2010. Retrieved 2012-12-19. ; 157th Infantry Brigade; Historical Data Card, 187th Inf Bde, GO 1, Sixth U.S. Army, 1962; 191st Inf Bde file, GO 1, XIV U.S. Army Corps, 1963; 205th Inf Bde file; all DAMHHSO. ^ James T. Currie and Richard B. Crossland, Twice The Citizen: A History of the United States Army Reserve, 1908–1995 (2nd revised & expanded edition), Washington, DC: Office of the Chief, Army Reserve (1997), pp. 254–255. ^ "Army Reserve: Organized for Success". Archived from the original on 29 May 2010. Retrieved 30 May 2010. Wilson, John B. Maneuver and Firepower: The Evolution of Divisions and Separate Brigades. Washington, D.C.: Center of Military History (1997). Wikimedia Commons has media related to United States Army Reserve. This page was last edited on 6 March 2019, at 21:08 (UTC).